NEW YORK -- The Federal Trade Commission said Monday that it is seeking to block the proposed combination of Staples and Office Depot because the deal would reduce competition in the office supplies market. The companies said they plan to fight to preserve the deal. Shares of the two office supply retailers fell sharply. The FTC said corporations rely on Staples and Office Depot to buy pens, paper clips and other supplies at low prices. A deal between Staples and Office Depot would cut competition and lead to higher prices, the FTC said. 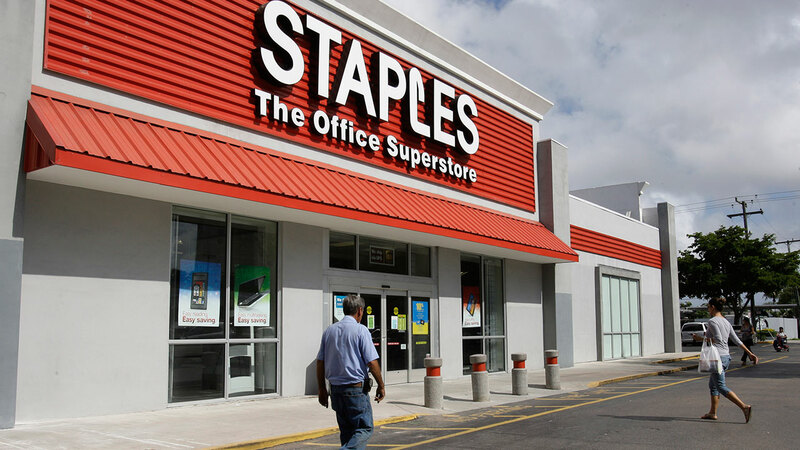 The decision comes 10 months after Staples offered to buy rival Office Depot for $6.3 billion. Staples and Office Depot said they plan to show that the FTC's decision is based on "a flawed analysis and misunderstanding" of the competitive landscape the companies deal with. The pair argue that competition has become even tougher since Office Depot and OfficeMax merged in 2013 and that the FTC is contradicting itself because it said that the office supply market was highly competitive two years ago. Office Depot Chairman and CEO Roland Smith said Staples and Office Depot plan to pursue legal options in order to complete the deal. Staples is based in Framingham, Massachusetts, while Office Depot is based in Boca Raton, Florida. Shares of Staples Inc. fell $1.73, or 14 percent, to $10.63 in afternoon trading Monday. Shares of Office Depot Inc. were down $1.09, or 16.4 percent, to $5.55.